Ethical Boardroom talks to the head of the Dubai Electricity and Water Authority on the company’s mission to become a sustainable and innovative world-class utility. Ethical Boardroom: Dubai Electricity and Water Authority (DEWA) recently conducted a periodic review of its corporate governance system. What steps have been made to ensure its effectiveness going forward? Saeed Mohammed Al Tayer: DEWA’s corporate governance framework includes a range of elements, such as IT governance, internal governance, sustainability governance, water governance and project governance, which are constantly reviewed and updated. DEWA follows the rollout of research and guidance issued by organisations, such as the World Bank, United Nations, the Organisation for Economic Co-operation and Development (OECD), the International Monetary Fund (IMF) and the International Finance Corporation (IFC), as well as various energy agencies and regulators worldwide. The comprehensive review of our governance is an ongoing exercise which must happen at least twice a year. All progressive organisations that seek to implement corporate governance best practices should conduct periodic reviews to inculcate good governance practices. These reviews and focus on governance have already delivered positive results. In terms of financial robustness, DEWA is the only government body in Dubai with credit ratings and has continually advanced its ratings since 2010 based on its strong financial performance, with a Baa1 rating from Moody’s and BBB+ from Standard & Poor’s. DEWA has also won numerous awards and certifications. These are achieved only if the corporate governance framework, policies and processes are maintained and up to date. EB: Why is it essential for a state-owned enterprise, such as DEWA, to have in place a modern and advanced governance system? AT: Good governance is essential for any organisation and more so if it is a public organisation. DEWA is committed to good governance as a strategic objective and as a core value of its principles. This is essential for any utility, whether publicly or privately owned. This has been supported by the OECD, showing the need for good governance in state-owned enterprises (SOEs) in its Guidelines on Corporate Governance for State-Owned Enterprises, released in 2015. The traditional concept of good corporate governance being a necessity for listed companies has changed considerably and now the ‘governance of things’ is essential for all organisations, whether corporate, listed or government-owned. DEWA has pioneered good governance and adopted its own framework more than a decade ago. This framework has the four basic pillars: accountability, transparency, responsibility and fair practices, all of which are embedded in the corporate culture of DEWA. The board, MD & CEO, and management oversee the effective implementation of these pillars and lead the way to establish DEWA as one of the most trusted and respected organisations in the region and instil a culture of good governance at DEWA. These in turn have enabled DEWA to forge strong relationships with its stakeholders, based on trust and accountability. DEWA has identified seven stakeholder categories. These include customers, government, employees, partners, suppliers and sub-contractors, investors, and society and future generations. EB: Corporate governance in the UAE is constantly evolving. What is DEWA doing to stay ahead of the curve? AT: One of the main reasons for this evolution is the onset of disruptive technologies and the increased application of innovation, especially in Dubai. In the words of HH Sheikh Mohammed bin Rashid Al Maktoum, Vice President and Prime Minister of the UAE and Ruler of Dubai, “The UAE attracts great minds because they value opportunity, quality of life, transparency, good governance and sustainable growth.” DEWA considers innovation a key strategic role, as shown by its vision to become a sustainable innovative world-class utility. DEWA takes pride in being a leader in the implementation of good governance, with the UAE announcing its being a leader in the implementation of the fourth industrial revolution, DEWA is working to ensure that corporate governance is agile and dynamic, by applying innovative approaches to ensure better compliance and oversight. This requires that it cannot be relegated to committees and polices but has to be practised and proclaimed. Good governance is not just a part of our culture at DEWA, it is also one of our core values, and DEWA aims to set the pace for the best governance practices of the fourth industrial revolution. EB: Please tell us about DEWA’s Strategic Plan 2021 and how is it aligned to the Dubai Plan 2021? AT: DEWA is committed to achieving the objectives laid out in the Dubai Plan 2021 that were unveiled by HH Sheikh Mohammed bin Rashid Al Maktoum, to become a smart and sustainable city, as well as being sustainable with its resources. This has shaped our vision to become a sustainable innovative world-class utility that implements world-class governance and management standards within the DEWA 2021 strategy. Alignment is essential to our strategic planning, which is one of the reasons why DEWA is a strategy-focused organisation that was the first in the region to be inducted into the Palladium Hall of Fame for strategy planning and execution. DEWA’s alignment to the Dubai Plan 2021 is based on delivering on one of its key objectives that Dubai becomes transparent and reliable, which is a key objective of the government pillar for a pioneering and excellent government. in turn based on a comprehensive governance framework. EB: DEWA has an established best-in-class risk management structure. Is having a coherent enterprise-wide strategy essential to DEWA’s growth? AT: Risk management and a well-designed enterprise risk management (ERM) programme are essentials of modern organisations. The OECD has also highlighted the need for a well-designed risk management process as a part of an organisation’s governance framework. DEWA’s ERM clearly identifies the various risks that the organisation faces today and those anticipated in the immediate future. DEWA has outlined its risk mitigation and risk appetite definitions to support this. EB: Cybersecurity is a global issue affecting companies large, small, private and state-owned. Can you tell us about DEWA’s cyber risk strategy? CEO: There are increasing challenges and threats with the rapid developments in technology and the accelerating growth of smart transformation and the spread of technologies, such as the Internet of Things. Cyberattacks are estimated to cost companies around the world $300billion annually as almost one million new pieces of malware, computer viruses or other malicious software are created every day. The economic cost of cyberattacks, cybercrime and scams, are expected to reach $3trillion by 2020. Cybersecurity has become a key requirement for smart cities. That’s why DEWA is looking at the latest updates and adopting the best international practices in cybersecurity. EB: Can you tell us why it’s important to have CSR at the heart of your operations? AT: At DEWA, we are committed to giving back to the society and communities in Dubai. From an early stage, we have adopted an explicit policy for corporate social responsibility (CSR) aligned to international best practices. We have also set an integrated framework, which meets CSR standards, as we realise that our contribution to the local communities is essential. This framework includes social initiatives that are aligned with the UAE Vision 2021, the Dubai Plan 2021, and the DEWA Strategy 2021. In order to develop and implement our CSR strategy, we identified the actual needs of our stakeholders and developed an action plan around those needs. This maps out our objectives for sponsoring, implementing and assessing our internal and external CSR initiatives, and figuring out how they are meeting our stakeholders’ needs. The Higher Committee of the Year of Giving at DEWA has approved 12 main programmes to provide 27 social and humanitarian initiatives, covering the three themes of the Year of Giving in the UAE. DEWA’s CSR efforts have contributed to an increase in community satisfaction and happiness levels from 82 per cent in 2013, to 89 per cent in 2016. DEWA also received many international awards and certificates in CSR, including the MVO8000 global certification in CSR, becoming the first government organisation in Dubai to receive this global recognition. EB: What does it mean for DEWA to have received the BS 13500 certification – the code of practice for effective organisational governance? AT: I recently honoured the management team who took part in getting the BS 13500 code of practice for delivering effective governance of organisations’ certification. Obtaining the BS 13500 certification was based on their hard work and commitment to ensuring good governance is at the heart of our operations, and an established part of our culture at DEWA. EB: Why is DEWA making clean energy a priority? AT: It’s one of the prominent ways of using energy sources in the UAE as the country is located within the world’s sun belt. In Dubai, the potential of solar power can be harnessed by photovoltaic technology, reaching 2,150 kWh per square metre per year, while the direct part of the energy that can be used in concentrated solar power (CSP) technology is about 1,850 kWh per square metre per year. Such features further promote the use of solar energy in the Emirate. Dubai launched the Dubai Clean Energy Strategy 2050 in 2015, to increase its share of clean energy in the energy mix in Dubai to reach 75 per cent by 2050. DEWA will achieve this with the Mohammed bin Rashid Al Maktoum Solar Park going on stream, which is part of the infrastructure pillar that is one of the five main pillars of the Dubai Clean Energy Strategy 2050. These five main pillars are: infrastructure, legislation, funding, building capacities and skills, and having an environment-friendly energy mix. 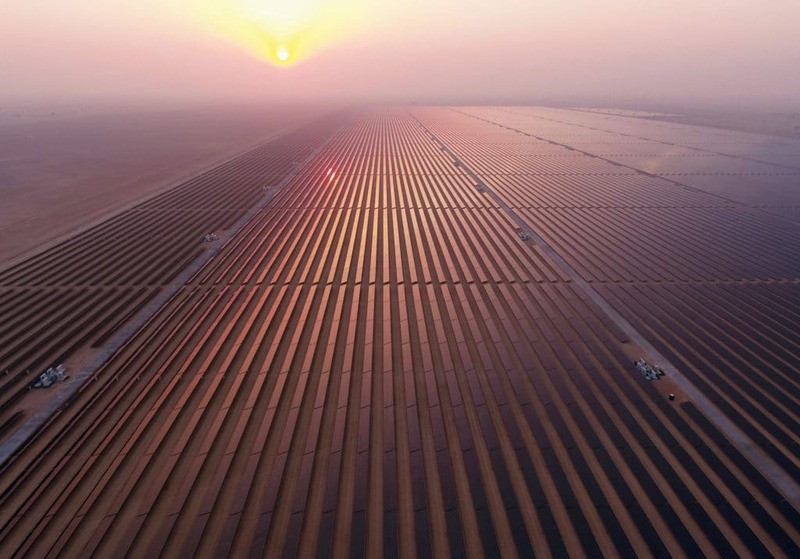 The Mohammed bin Rashid Al Maktoum Solar Park is the largest single-site solar park in the world, with a planned capacity of 1,000 MW by 2020 and 5,000 MW by 2030, with a total investment of AED 50billion. This will eventually save approximately 6.5 million tonnes per annum in emissions. DEWA intends to build the largest CSP project in the world, based on the independent power producer (IPP) model. DEWA has received the lowest international bid for its CSP plant at USD 9.45 cents per kilowatt hour. It will be operational by April 2021. DEWA will generate 1,000MW using this technology by 2030. DEWA gives its customers the chance to produce clean energy following the resolution issued by the Dubai Executive Council to integrate electricity produced from photovoltaic panels with the power distribution system in Dubai. The resolution formed a comprehensive legislative framework to connect electricity produced from solar power to the distribution system. The resolution supports the Smart Dubai initiative launched by HH Sheikh Mohammed bin Rashid Al Maktoum, to transform Dubai into the smartest city in the world and encourages customers to produce clean energy. This engages the community in the production of electricity from solar energy, diversify energy sources by increasing renewable energy targets, preserve the environment and lower the country’s carbon footprint, while also encouraging the development of a green economy to achieve sustainable development. DEWA’s Shams Dubai initiative also allows customers to install photovoltaic panels on their rooftops to generate electricity from solar power. The electricity is used onsite and the surplus is absorbed into DEWA’s grid. EB: How will innovation make a difference in your strategic priorities? AT: At DEWA, we work according to the directives of HH Sheikh Mohammed bin Rashid Al Maktoum, to promote Dubai’s global leadership and to continue the path of leadership and excellence to reach number one globally. We continuously review our work processes and procedures to maintain our lead, in line with the 10X initiative, which His Highness launched to make Dubai the city of the future by bringing about comprehensive change in the government work system, and developing innovative ideas and future plans. We work to keep pace with the Fourth Industrial Revolution and make use of disruptive technologies in the generation, transmission, and distribution of electricity and water, to provide world-class services that make life better for the citizens, residents, and visitors of Dubai, and provide electricity services that meet the highest standards of availability and reliability. DEWA has incorporated innovation in its vision and raised its importance to encompass 40 per cent of DEWA’s strategic map. DEWA has also included strategic objectives within its strategic map that focus on envisioning the future, innovation and happiness of stakeholders to achieve DEWA’s vision to become a sustainable innovative world-class utility and the Dubai Plan 2021 to make Dubai a city of happy, creative and empowered people. At DEWA, we have always invested in developing people who are capable of spearheading research and development in clean and renewable energy to further preserve natural resources and protect the environment. DEWA has launched several promising programmes, initiatives, and projects to achieve this goal, including MORO, which specialises in providing information storage services, cloud computing, and IT for the public and private sectors in the UAE and the region. These efforts support the National Innovation Strategy to make the UAE one of the most innovative countries in the world in support of the Smart Dubai initiative, to make Dubai the smartest city in the world. H.E. Saeed Mohammed Ahmed Al Tayer has an overall experience of more than 31 years in the field of telecommunications, energy, water, infrastructure, oil, gas and industry. Under his leadership since 1992 DEWA achieved unprecedented successes and has become one of the very best distinguished utilities in all aspects world-wide. As an initiative of his own, several successful companies were established, including Emirates Central Cooling Systems Corporation (EMPOWER), and many other companies. His Excellency is a member of Dubai Executive Council and Chairman of Infrastructure and Environment Committee, Vice Chairman of the Dubai Supreme Council of Energy (DSCE), Chairman of Dubai Smart City Office, Vice Chairman of Emirates Global Aluminium (EGA), Vice Chairman of Emirates National Oil Company (ENOC), Vice Chairman of Dragon Oil Company, Chairman of UAE Water Aid (SUQIA) Board Of Trustees, and Chairman of World Green Economy Organization (WGEO). In addition, His Excellency is a member, vice chairman, or chairman of various high-level committees and higher leading councils in the Emirate of Dubai.